Art Nouveau – the French version of what is also called Jugendstil or Modern style in other countries – is not represented that often in Paris, the French heart of Art Nouveau being Nancy, in the former mining region Lorraine. But in modern and rich districts of Paris, like the 7th and the 16th arrondissements, urbanized around 1900, it is possible to admire a few brilliant Art Nouveau buildings, the two most significant architects in Paris being Hector Guimard (who also designed traditional metro entrances of Paris) and Jules Lavirotte, who shares a lot of common tastes with Catalan worldwide famous architect Gaudi. 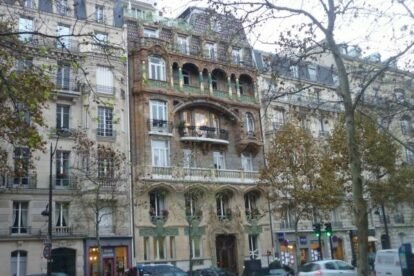 Just a few steps from the Eiffel Tower, on Avenue Rapp, the Immeuble Lavirotte had its façade restored in 2011, and it would be a pity not to go there if you’re an architecture enthusiast. In the same neighbourhood, the Cité Rapp (a cul-de-sac located few meters away) and the Maison des Arums (33 rue du Champ de Mars) are two other examples of Art Nouveau in Paris, and if you really like the style of Jules Lavirotte, don’t miss the eccentric Céramic Hôtel, near the Arc de Triomphe, at 34 Avenue de Wagram.